No matter where in the mouth you have lost a tooth, you can replace it with a single dental implant that looks completely natural and is extremely durable. For some patients, the loss of a tooth can be quite distressing, especially if this it is from near the front of your mouth or a front tooth. At Northway Dental Practice we offer resilient and cosmetically pleasing dental implants as a subtle and stable solution to missing teeth. Implants are designed to look and feel exactly like your natural teeth, so a gap in your smile can be filled with minimal chance of others noticing any change in your appearance. 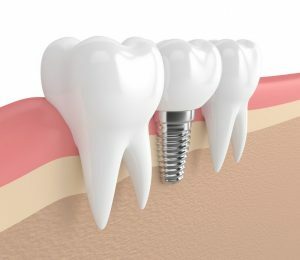 An implant is made up of three components. The first is a titanium screw which is placed into the jaw bone. This screw acts as a replacement root for your new tooth. An abutment or post is then placed on top of the implanted screw and this holds the third component – the crown (prosthetic tooth) – in place. The crown is the only visible part of the implant. Once the implant has been placed in the jaw, we will need to wait for a few months for your mouth to heal. In this interim period, your dentist will fit a temporary crown so that the gap is filled. If you have lost a tooth or are due to have a tooth extraction, please speak to us about a single implant. Book your consultation now, please click here or call 0151 526 2701.